Joan Planella i Rodríguez (1849–1910), The Little Weaver (1882-89), oil on canvas, 67 x 55 cm, Museu d'Història de Catalunya, Barcelona, Spain. Wikimedia Commons. The first article in this two-part series looked at paintings of earlier phases of the Industrial Revolution, up to 1880. These had started with awe-inspiring industrial landscapes, concentrated on activities and the environment inside factories and ironworks, then during the 1870s had come to focus on the men and women working there. 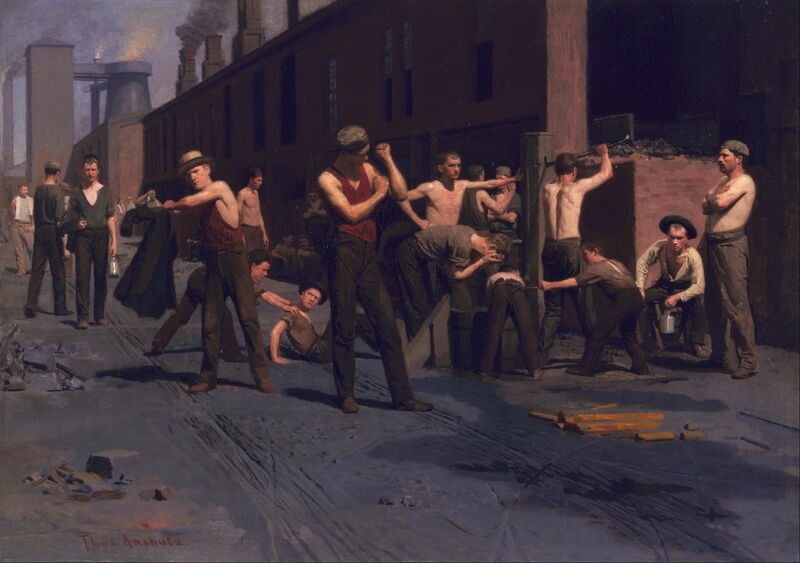 Thomas Pollock Anshutz (1851–1912), The Ironworkers’ Noontime (1880), oil on canvas, 43.2 × 60.6 cm, Fine Arts Museums of San Francisco, San Francisco, CA. Wikimedia Commons. 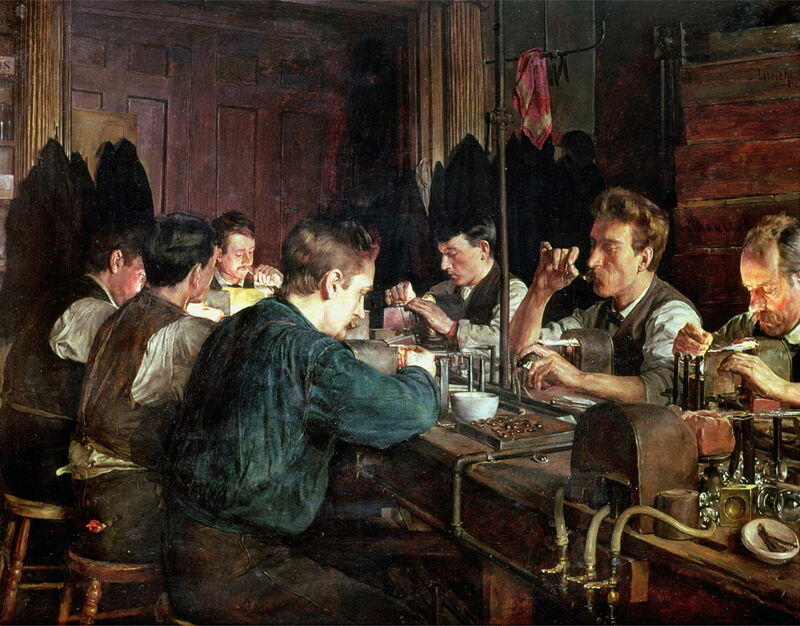 Thomas Pollock Anshutz’s The Ironworkers’ Noontime (1880) uses the ironworks as its background, and shows the iron workers during their short lunchtime break. They are taking turns to wash the grime of the morning off their arms and faces, and enjoying the moment out in the sunshine. John Singer Sargent (1856–1925), Venetian Glass Workers (1880-82), oil on canvas, 56.5 × 84.5 cm, Art Institute of Chicago, Chicago, IL. Wikimedia Commons. 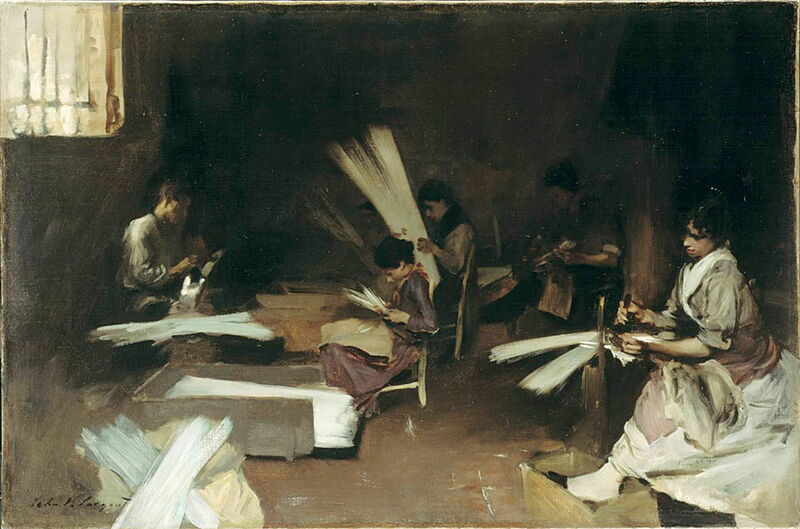 John Singer Sargent’s early painting of Venetian Glass Workers was made in 1880-82. These women appear to be preparing bundles of fine glass rods, which would presumably go on to further manufacturing processes. Ernst Josephson (1851–1906), Spanish Blacksmiths (1882), oil on canvas, 128.5 x 107 cm, Nasjonalgalleriet, Oslo, Norway. Wikimedia Commons. 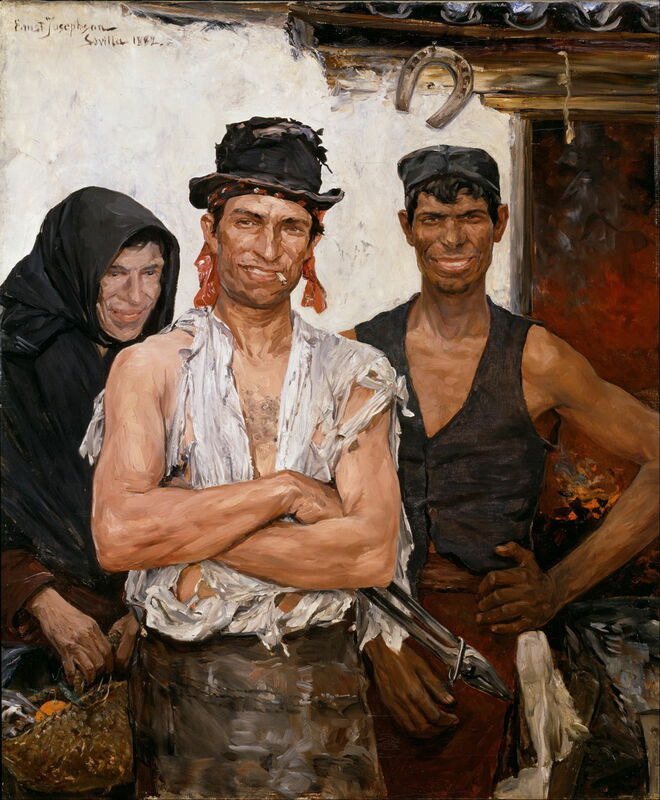 During the 1880s, painting the portraits of workers became increasingly popular. Ernst Josephson’s Spanish Blacksmiths (1882) is a fine example of a Naturalist, or ‘social realist’, portrait in which its objectivity is enhanced by the white wall behind them. Josephson has painted every rip, tear and fray in the remains of the white shirt worn by the man in the middle, and his muscular forearms are almost hyper-real. Charles Frederic Ulrich painted in fine Naturalist detail too. In The Glass Blowers (1883) the work is more delicate: blowing and preparing glass domes, perhaps for use as covers of watches and clocks. Charles Frederic Ulrich (1858–1908), The Village Printing Shop, Haarlem (1884), oil on panel, 54 × 58.3 cm, Terra Museum of American Art, Chicago, IL. Wikimedia Commons. 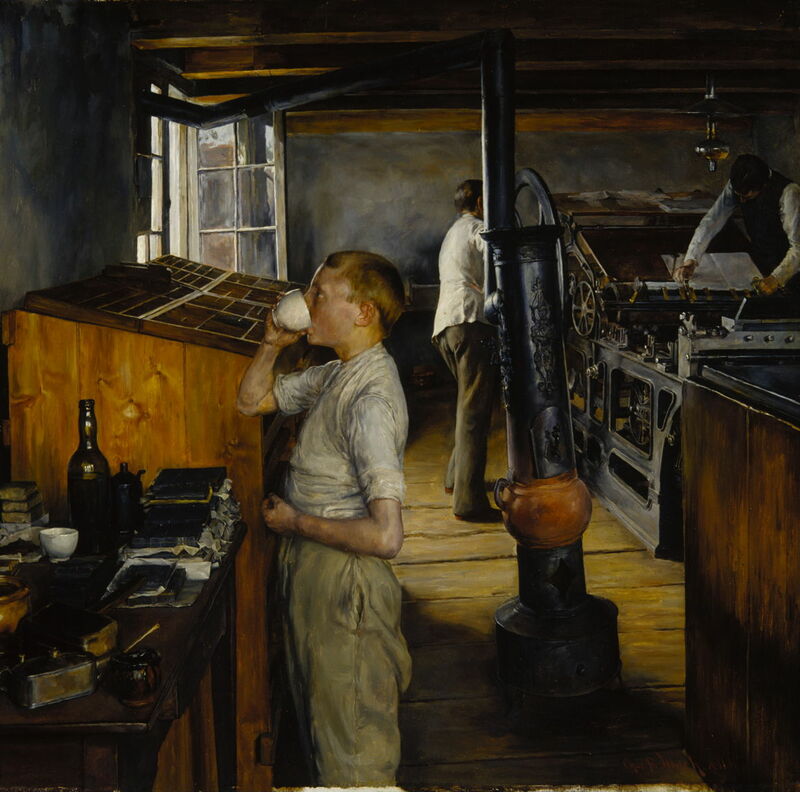 Ulrich also painted a young apprentice drinking during a moment’s pause in his work in The Village Printing Shop, Haarlem (1884). The employment of children, who might otherwise have been in school, was becoming controversial in many societies. With artists now drawing attention to the workers and their conditions, social messages developed in their art. Joan Planella i Rodríguez (1849–1910), The Little Weaver (1882-89), oil on canvas, 67 x 55 cm, Museu d’Història de Catalunya, Barcelona, Spain. Wikimedia Commons. Joan Planella i Rodríguez’ The Little Weaver (1882-89) is a superb Naturalist painting with strong social content. This version is a replica of the artist’s original, which was completed in 1882. 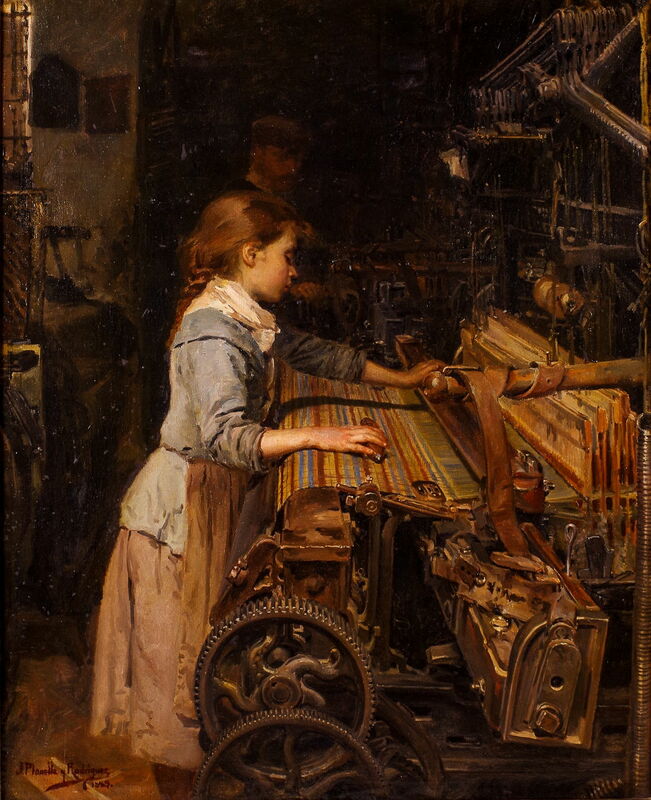 It shows a young girl working at a large and complex loom in Catalonia, as a man lurks in the background, keeping a watch over her. This work was awarded a medal when it was exhibited at the Chicago World’s Fair in 1893, and was purchased from there into a Saint Louis public collection. It didn’t return to Catalonia until 2012. Christian Ludwig Bokelmann (1844–1894), Lead Mine in Selbeck (1888), oil on cardboard, 50 × 60 cm, Alte Nationalgalerie, Berlin, Germany. Wikimedia Commons. Christian Ludwig Bokelmann’s oil sketch of a Lead Mine in Selbeck (1888) has a more subtle social message for an ancient industry which had long recognised the toxicity of the lead which it worked with, but which continued to employ children. Jean-Eugène Buland (1852–1926), Un Patron, or The Apprentice’s Lesson (1888), oil on canvas, 102 x 82 cm, Nationalmuseum, Stockholm, Sweden. Image by Erik Cornelius, via Wikimedia Commons. Another Naturalist artist, Jean-Eugène Buland tackled more complex issues in his Un Patron, or The Apprentice’s Lesson (1888). After France’s ignominious defeat in the Franco-Prussian War, efforts were made to make France more industrial and more modern. 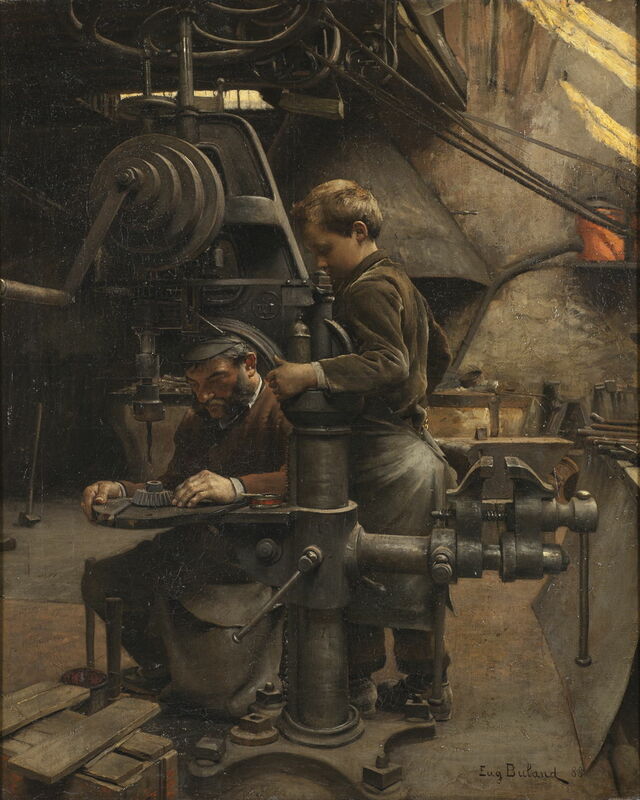 Here a young boy is being trained by the foreman to make a cogwheel, when many would have preferred him still to be at school. Buland used photographs quite extensively in the preparatory work for this painting, to capture its wealth of detail. Édouard Joseph Dantan (1848–1897), Glasshouse Under Construction (1890), oil on canvas, dimensions not known, Musée Petiet, Limoux, France. Wikimedia Commons. 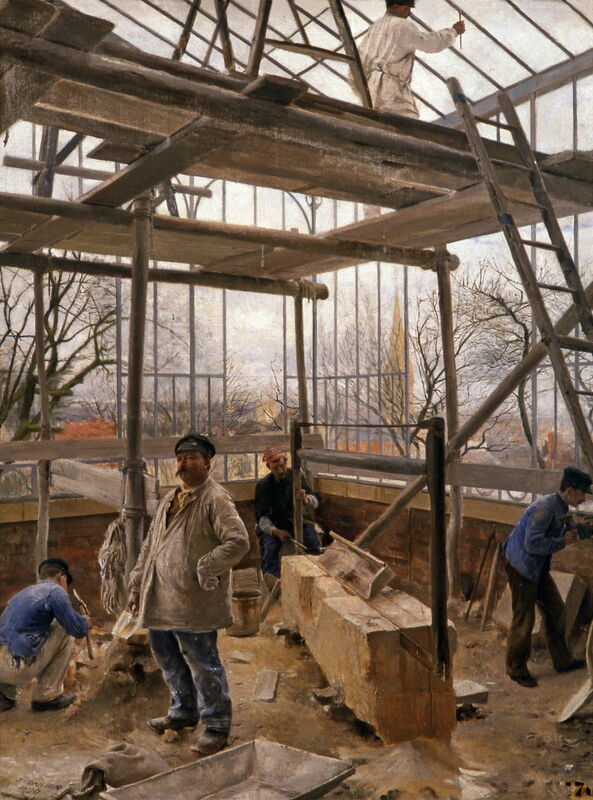 I have not included paintings of the reconstruction of major cities such as Paris, but this by Édouard Joseph Dantan shows some of the more traditional skills still being used for a Glasshouse Under Construction (1890). Alessandro Milesi (1856–1945), The Spinners (date not known), oil on canvas, 50 x 62.5 cm, location not known. Wikimedia Commons. Painting men and women at work was by no means confined to Naturalists, with their attention to fine detail. Alessandro Milesi’s undated The Spinners is a much looser oil sketch which could qualify as being an Impression. 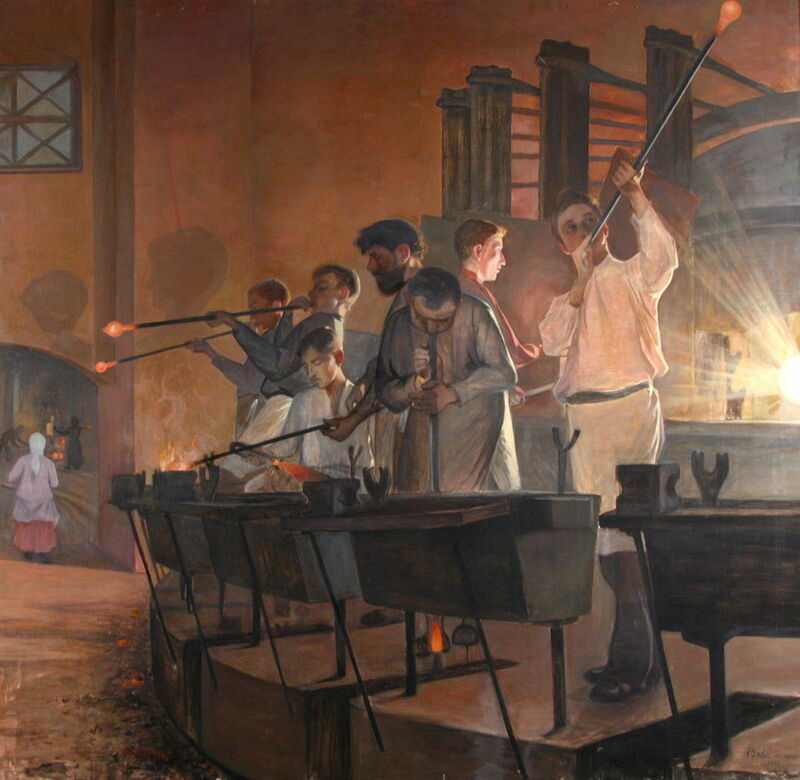 Beda Stjernschantz (1867–1910), Glassblowers (1894), oil on canvas, 142 x 146 cm, K. H. Renlund Art Museum, Kokkola, Finland. Wikimedia Commons. Beda Stjernschantz shows a more usual view of Glassblowers (1894) working on larger-scale products. This was painted from life in a glass factory at Impilahti in Finland, on the shore of Lake Ladoga. In 1944, this area was ceded to Russia. 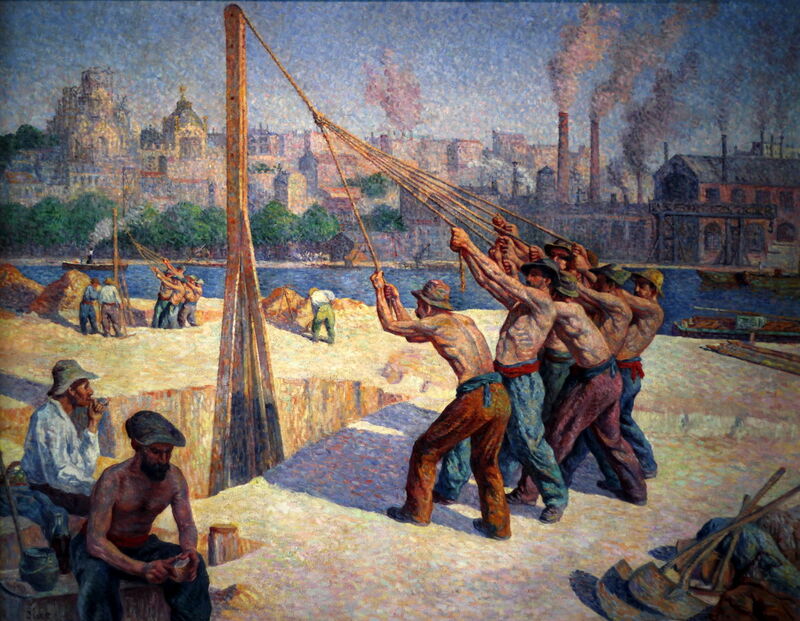 Maximilien Luce painted many works showing people at work, as his style moved on from Neo-Impressionism to Post-Impressionism during the 1890s. 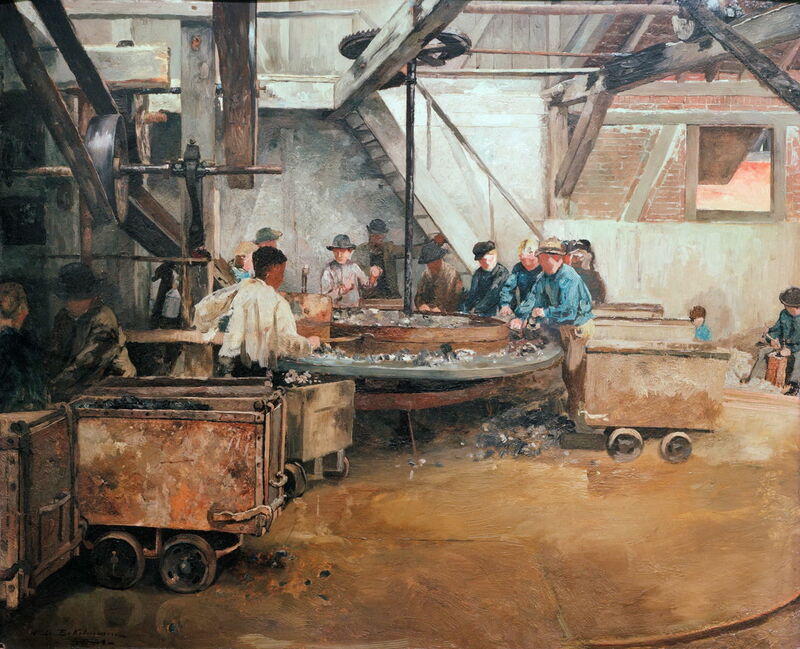 His Charleroi Foundry, Casting (1896) shows this well, and is one of a long series he painted showing those working in heavy industry. Luce’s The Pile Drivers (1902-3) shows the very active construction work which continued in Paris in the early twentieth century, with blocks of factories on the opposite bank, infiltrating the surrounding residential and commercial districts. 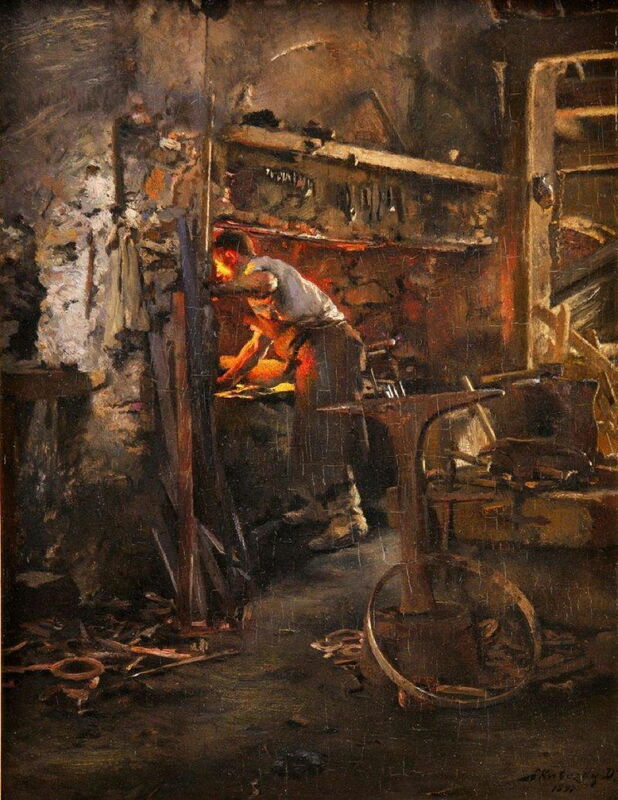 Döme Skuteczky (1848–1921), In the Smithy (1897), mixed media, 28 × 21 cm, location not known. Wikimedia Commons. Döme Skuteczky’s painting In the Smithy from 1897 returns to smaller-scale and more traditional industry. 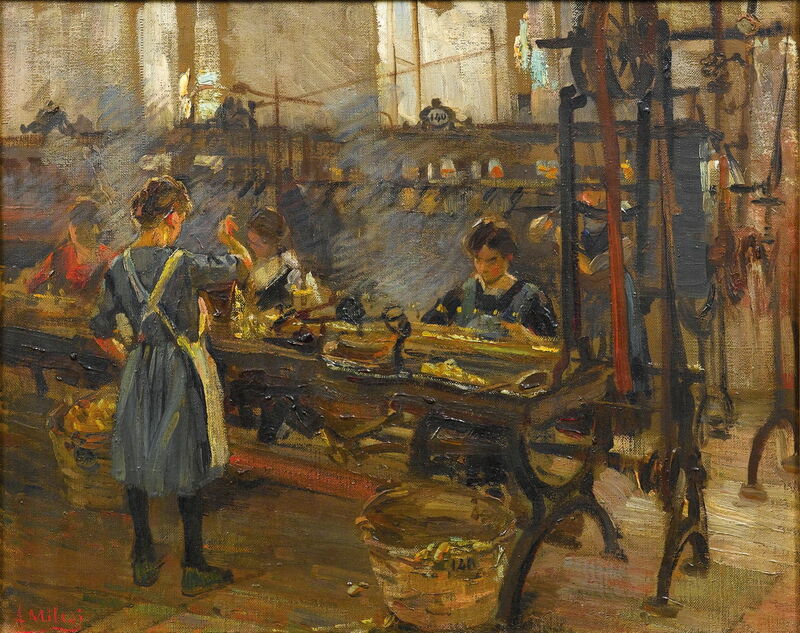 Jean-Eugène Buland (1852–1926), The Tinker (1908), oil on canvas, 112.6 × 145 cm, Private collection. Wikimedia Commons. Not all metal working was heavy and large-scale. 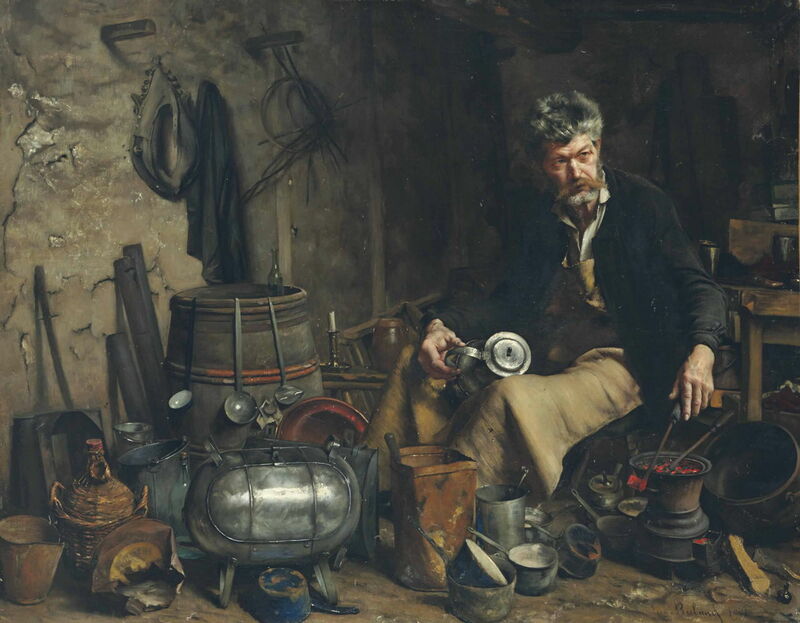 Jean-Eugène Buland uses strongly Naturalist style to depict The Tinker (1908), who repaired damaged pots, pans, and domestic metal objects in a cottage industry which predated the Industrial Revolution. Hans Baluschek (1870–1935), Steel Rolling Mill (1910), oil on canvas, 63.5 × 91 cm, location not known. Wikimedia Commons. 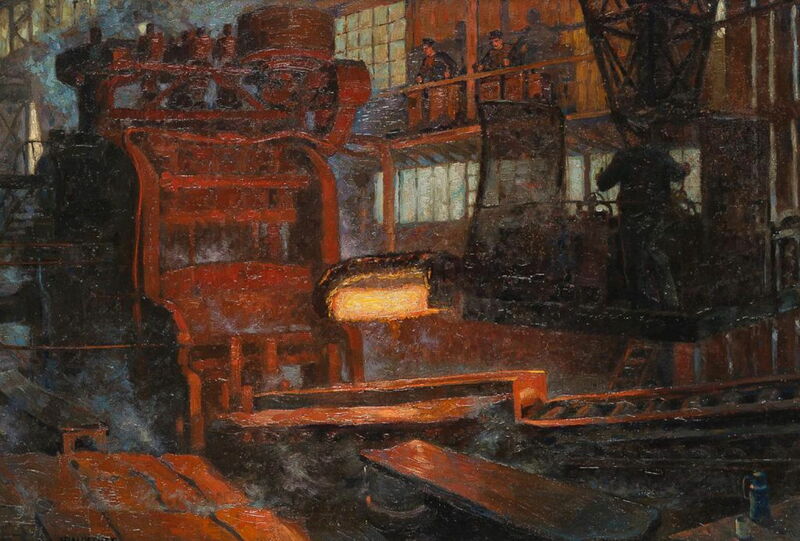 With the decline of Naturalism in the early twentieth century, the emphasis on workers weakened, and artists like Hans Baluschek returned to painting heavy plant and processes in his Steel Rolling Mill (1910). 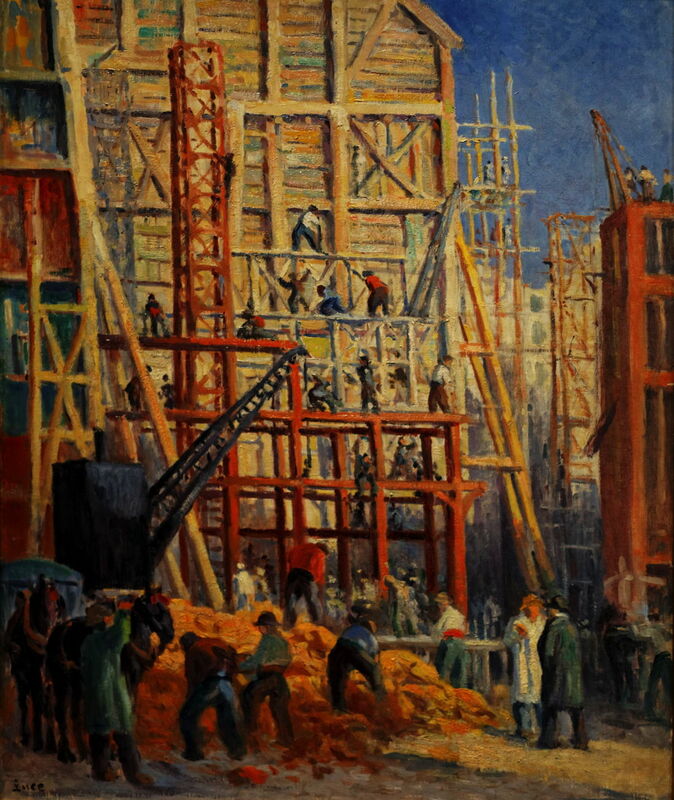 Maximilien Luce’s Construction Site (1911) is another depiction of those at work in Paris at the time, and shows the high chroma influence of the Fauves. 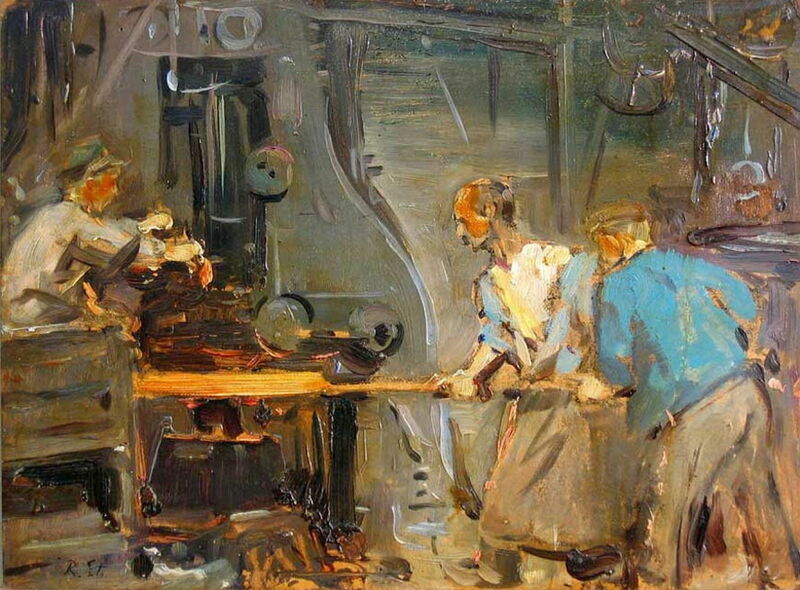 Robert Sterl (1867–1932), Ironworkers (Krupp) (1919), oil on cardboard, 23.5 × 31 cm, location not known. Wikimedia Commons. 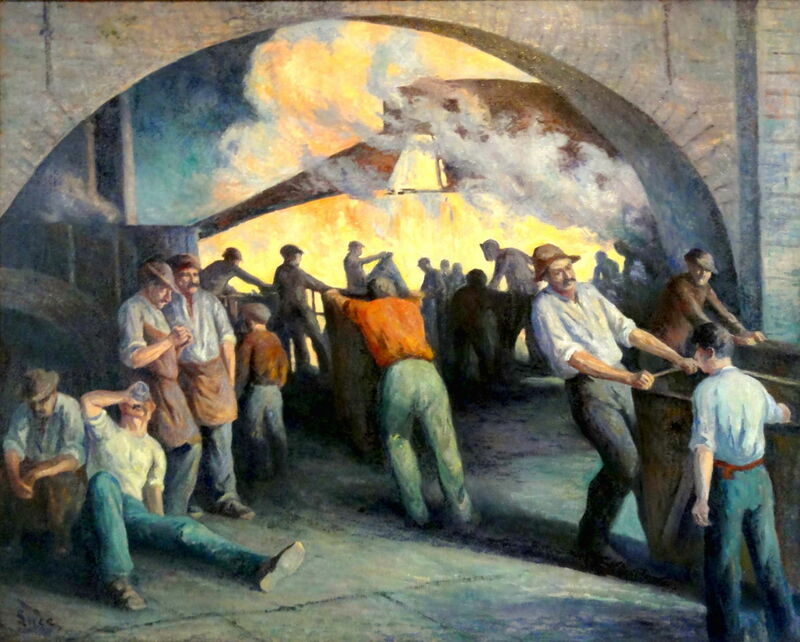 Finally, Robert Sterl’s Ironworkers of 1919 is an oil sketch showing workers at one of the Krupp plants in Germany. Posted in General, Life, Painting, Technology and tagged Anshutz, Baluschek, Bokelmann, Buland, Dantan, Josephson, labour, Luce, Milesi, naturalism, painting, Planella, realism, Sargent, Skuteczky, Sterl, Stjernschantz, Ulrich, workers. Bookmark the permalink. Great series! Images of people at work give us insights we do not find elsewhere about the engines that made our world. You’ve made a terrific selection. Hope similar topics attract you in the future. Thank you – I found them quite fascinating. They’re part of my current overview of ‘social realist’ or Naturalist art in the late nineteenth century. I have several more topics to come, and I hope that they will prove as interesting.